BPA-Free Water Bottle to Make Your Dreams Come True This Year! Not only believe that you WILL accomplish all your goals, but feel as if everything is already true! The law of attraction will help you reach your goals much faster by simply believing and removing all self-doubt and worry. We attract what we think about so if we worry and doubt, this is what we create as our reality. First, start with the internet and find images of everything you want in your life. This is cool – it’s like shopping! Save images in a Word doc and print in color. Next, go through magazines and cut out any words or images that resonate with you. Get an eco glue stick and large white poster board. Arrange everything on your vision board and then glue. Hang where you can see it every day and take a few moments each day to look at your board and visualize what you are doing and how you are feeling as if everything on the board is already your reality. You will be shocked at the end of the year, what has come true! Dreaming big is just the first step. Taking action is a must! Want to lose weight? Start a food plan, sign up at the gym, find quick 10 minute work outs you can do at home, etc. Want to buy a house? Start looking on Zillow.com as if you were buying a home right now, contact a lending company to see what you need to do, and start looking at houses with a broker. Want to find love? Write down your ideal match and envision yourself meeting and going on a date. Try out a dating service or speed dating event…or just be open to finding love. You never know who is around the corner. Losing weight is a common resolution, but take it a step further to live a lifestyle of clean eating. What we put in our bodies impacts us physically and emotionally. Eating clean helps promote weight loss, increases energy, and will make you feel like a new person. Try Dr. Oz’s Total 10 two week challenge! Our favorite tip! Drinking water will change your life from promoting weight loss to overall health, energy, and more. Drinking half your body weight in ounces is a great way to determine how much water your body needs. Our Bubi Bottle: bpa-free water bottle and Sports Cap make drinking water easy! Take a few minutes each day to reflect, go through your gratitude list, and be mindful. Meditation is really easy and there are so many ways to do it. Doesn’t it feel awesome to have a good belly laugh? Laughing boosts our happiness and actually creates healthy cells in our bodies. Smile and laugh even if it’s just by watching funny movies! Being kind to others even when no one is looking also boosts our happiness. Be kind to others and take a moment to do something to make others smile. Happy New Year and thank you for supporting Bubi! 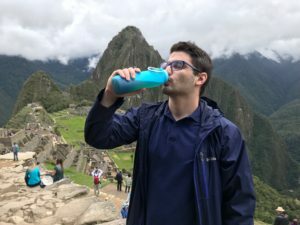 The Bubi is an bpa-free water bottle that is collapsible, made from food-grade silicone, is BPA-Free, and is the coolest bpa-free water bottle on the planet. Easy to clean – just turn inside out! When not in use, the bottle folds up to save space. Check out the Bubi shop for eco baby bottles, eco toddler bottles, and bpa-free water bottles for us adults too!